I have waited to post about this until I was emotionally ready...and off pain meds. I broke my left arm while in New York. There, I said it. I am severely left sided, so yes, it's my writing, drawing, painting, washing, EVERYTHING ARM...you get the idea. I actually did my last post with Jennifer's help because I missed everyone while I was gone. I also felt bad because my previous post was about a death and I wanted to not jump in and have this be my next news. First off, the week before we left for NY was hard. Jennifer also didn't get to participate in saying goodbye to her friend because of the NY show. She then left the show early for Wyatt's first day of kindergarten. My Tim flew in to take Jennifer's place because tearing down the booth and packing crates is a multi-person job. Tim and I had Thursday to ourselves and were so looking forward to exploring New York and seeing Mama Mia! the musical. Friday I had an appointment at Michael Miller Fabrics that I was pumped about. Major change of plans. Tim tells me as we were crossing the street I stepped onto what looked like a flat surface, but was a 3" drop. As I lay there I could not feel my arm at all. Terrifying, I must admit. But then the pain. I'll spare details, except that the humerus bone was broken in half and a very unclean break. Because it wasn't a compound fracture I was placed in a temp splint...that ended exactly where the break started (yeah), which was no fun. A specialist could not see me for 6 days in NY I was told, so had to make it back home, no fun, and finally got help Monday. In the meantime I held my own arm together for 4 days, so I couldn't use my right arm either. Living in Indianapolis has it's perks because we are a very sports oriented city and sports medicine abounds. I've been rubbing elbows, while ever so gently, with many people that have great stories to tell about their injuries. Lots of famous athletes pictures adorn the walls. I'm like a third the size of everyone else. I'm thinking I should send my signed autograph just for fun...since I'm having so much! Anyway, my reality has sunk in. I am without my creative arm...don't know yet how long. Very good news is that I have no nerve damage and will not need surgery, as we were told in NY. Once they took the splint off and put me in a contraption that holds my arm to my body, things started going better. My arm is very swollen still and yesterday they added an elastic sleeve over my forearm and elbow which looks like an overstuffed sausage. I'm not posting pics, if that's okay. Just envision a rubber arm 2 times your normal size in multi colors tied to your body. There..a visual image will do, don't you agree? It's a tough break, pun intended. Yet a mere hiccup in the scheme of things. I know I have some challenges ahead. I have the Quilt Market coming up in October and all the prep for my Flights of Fancy debut. Hmmm, I see NO sewing in my near future. I am determined right now to be the recipient of a miracle! Always loved a decent challenge, so here's one....being a one armed designer! I would appreciate your prayers. I was so excited to get back from NY and dive into designing and creating. I live and breathe to design. I'm not out to prove anything, but I want to be there in Houston, come October, to wow you into my booth and welcome each and every one with a huge hug. That's what I'm talkin about! I apologize for taking off out of town without posting beforehand. There was so much to do and that last week was filled with drama. Then once we got to New York we had a busy schedule and bad internet connection. So, I'm back with photos and stories. 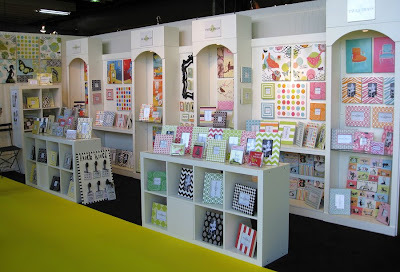 First off, we had a space at the New York Gift Show in the Studio Section, so we took a photo to show you a bit of our set-up. Hard work and late nights. Once the show started Jennifer and I fit in a couple fun things. Here we are in front of Rockefeller Plaza. In the summer the skating rink is transformed into eateries. Also, had some business at Michael Miller Fabrics a couple of days. Lots of cab rides, which is always an adventure. One particular driver honked and barked at everyone. 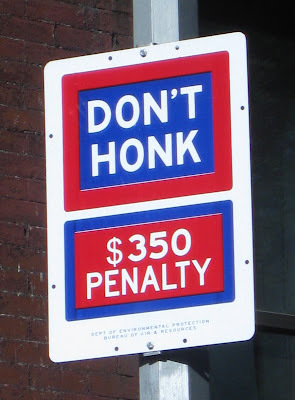 As I observed, I realized even though his honks sounded the same, they actually had different meanings. I commented to Jennifer that there should be different honk sounds...like a little keyboard w/ symbols. Like a picture of a pedestrian w/ a bullseye, or the finger. As I'm chuckling and wondering if that might be how I make my 1st mil Jennifer reaches for the camera and snaps this Don't Honk sign. Now that tickles my funny bone. 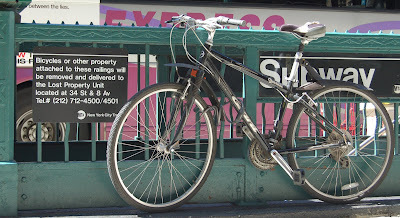 Next sign warns not to attach bicycles to the railing. Is it just me, or does anyone find this humorous? It was great to be in New York and to actually meet some of you for the first time. Had some wonderful chats and made new connections. Now I must say, I really missed you all and am so happy to be in touch again. 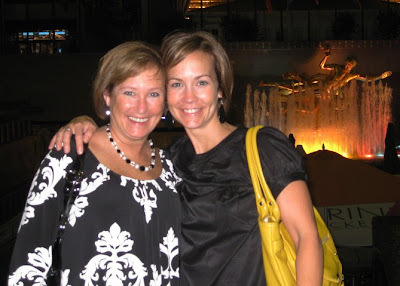 Julie - wife, mother, daughter, sister, and friend has lost her fight with cancer. Julie and Jennifer were friends from college and she was a fan of ours! Julie was such an inspiration to us through her battle and we plan to honor her wishes by celebrating her life. One of the incredible blessings that comes along with blogging is that sometimes you just really connect with certain people and they let you into their lives. We get to share joys, tragedies, struggles and triumphs. I have been granted permission to give you a glimpse into the life of one such blogger and now friend. 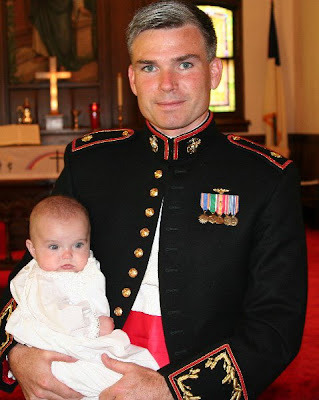 This is Chris, a Marine Pilot, and the oh so handsome husband of Missy (Sweet Funky Vintage) holding their second daughter at her Christening. Chris has just been deployed sooner than expected to Iraq while Missy is still settling in with their 3 children from a very recent move to the west coast. Just hope you can go over from time to time and say hello to Missy and offer some words of friendship and encouragement. She's such a sweetheart, and I imagine a little lonely and overwhelmed with three little ones running around. I also hoped by putting this photo on my blog, that it will keep our thoughts and prayers for our soldiers close to the surface. I want to give a huge shout out to both Print & Pattern and Design Healing for giving me such kind mentions this week....well, more like a spread! Please take time to visit these blogs. I know most everyone is familiar with Rock Star Bowie over at P&P, but please go check out the great Design Healing blog of Stephanie Ryan. Her day job is a Senior Concept Designer for Lenox. How cool is that? And that's not all she's up to, so go check it out, won't you? Then I really want to let you all know just how much your kind comments and emails have meant to me. I've only been blogging a few months and was a virtual unknown in this arena. Your acceptance and enthusiasm is so...so...WOOHOO!!!! Thanks a million.